The Windows.old file is created when you perform an upgrade to Windows 8, perform a refresh, or perform an installation where you don't reformat the drive prior to installation (i.e you are installing Windows 8 onto the same partition as Windows 7). In instances where you have done an upgrade on an upgrade (e.g. from Vista to Windows 7 and then again to Windows 8 you may also may have a Windows.old.000 folder present. this is the older installation data. Having these files can eat up a lot of room, especially on smaller laptop SSD drives. in this article, we show you how to remove these folders. NOTE: before deleting any files or folders, you need to ensure that you no longer need any files or folders located in this location. If in doubt you must back this up to external storage. This method is very straight forward and can be scripted for situations that invlove upgrades in an organisation. 3. 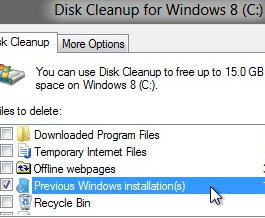 In the lower left hand corner, you will see an icon labeled "clean up system files", choose this. 4. You may be prompted by UAC, choose Ok. you may need to repeat step 2. 5. 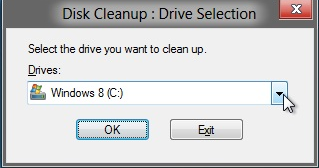 In the disk cleanup menu, scroll to previous Windows installations, and then tick this box. choose OK to continue. This will mark the Windows.old file for deletion. 7. this will now delete the windows.old file. This operation has been cancelled due to restrictions in effect on this computer. Please contact your system administrator.